Is This Cosy Retreat the Best Place to Stay in Lombok? | My Five Acres. Travel. Adventure. Yoga. Is This Cosy Retreat the Best Place to Stay in Lombok? If you’re looking for the best place to stay in Lombok, Indonesia, you may have just found it. If you want relaxation and romance with an outstanding view from not one, but two infinity pools, The Puncak is waiting to welcome you. As I ascend the staircase that leads to the outdoor lobby of The Puncak, a strange feeling overcomes me. I struggle to put my finger on it. What is it? Set on the summit of a hill overlooking Senggigi beach and the Bali sea, with Bali’s magnificent Mount Agung providing the backdrop, The Puncak offers something that no Senggigi beach hotel can provide: tranquility. The Puncak’s tranquil setting is a rare find in busy, noisy Lombok, Indonesia. There are no ultra souped-up motorbikes roaring by, no honking busses blasting your eardrums, and no package tourists, intent on wringing every last ounce out of their once-a-year holiday. With only five luxury rooms facing onto twin infinity pools, The Puncak is the definition of a romantic boutique hotel. It was specially designed for honeymooners, romantic mini-breakers, or couples who seriously need to get away from it all. For us, it was the perfect place to recover from our epic hike up Rinjani and busy week on the beautiful, but over-touristed, Gili Islands. We left thinking it just might be the best place to stay in Lombok. Click below to watch our live hotel room tour of The Puncak. If you like it, please like or even share the video! It’s a huge help to us. Indoor-outdoor living. Lombok’s year-round temperatures hover in the high 20s, a perfect climate for living life outdoors. At The Puncak, the rooms are fronted by floor-to-ceiling sliding glass doors which open wide, completely removing the barrier between inside and out. Private dining. Each room has a private dining table overlooking the pool where couples can have a romantic meal or a lazy breakfast without having to chat with the neighbours. Food just tastes better when it comes with a view like this. Two infinity pools. With two pools shared between five rooms, overcrowding is never going to be a concern. The cool pools are long enough to swim lengths, too, should the need for a little vigorous activity arise. Extra-comfy bed. Just like Goldilocks, I usually find most hotel beds are too hard or too soft. The beds at The Puncak are so just right that it was tempting to stay there all day. According to Jean-Paul, The Puncak’s friendly owner, they are even chiropractor-endorsed. Your back will thank you. The beds at The Puncak are so comfy you’ll want to sleep all day! The little extras. The marble bathroom features a rain shower with steady water pressure, and comes equipped with botanical soap, shampoo, and conditioner. Slippers and light batik robes are provided and there is plenty of space to unpack and hang your clothes. Plus, the towels are extra fluffy and huge! Outstanding ocean views. From almost every spot in The Puncak, you can gaze out over the Bali Sea, watch fishing boats float by, and marvel at the beauty of Bali’s Mount Agung, a 3000m volcano which, as I write this, is threatening to erupt. Precious stone feature walls. 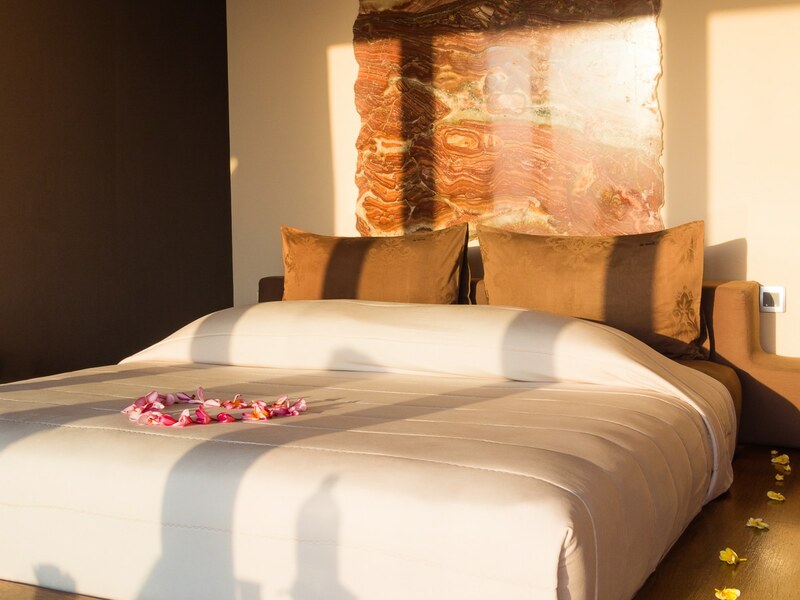 Each room at The Puncak has a feature wall covered in a large slab of precious stone. Our room was the Onyx Breccia de Venice room. Since Onyx is said to have healing properties, we thought it was the ideal room for us after our Mount Rinjani trekking adventure. Friendly luxury. Privately owned by Jean-Paul and Nury, The Puncak provides luxury without all the stuffy pretension of many Lombok resorts. With Jean-Paul on hand to chat and give you the lowdown on things to do in Lombok, staying in The Puncak feels a little like a stay with friends — but a lot more romantic. Beautiful breakfasts. The breakfast spread at The Puncak is, quite frankly, a little intimidating. How can we possibly eat this much, we wondered? 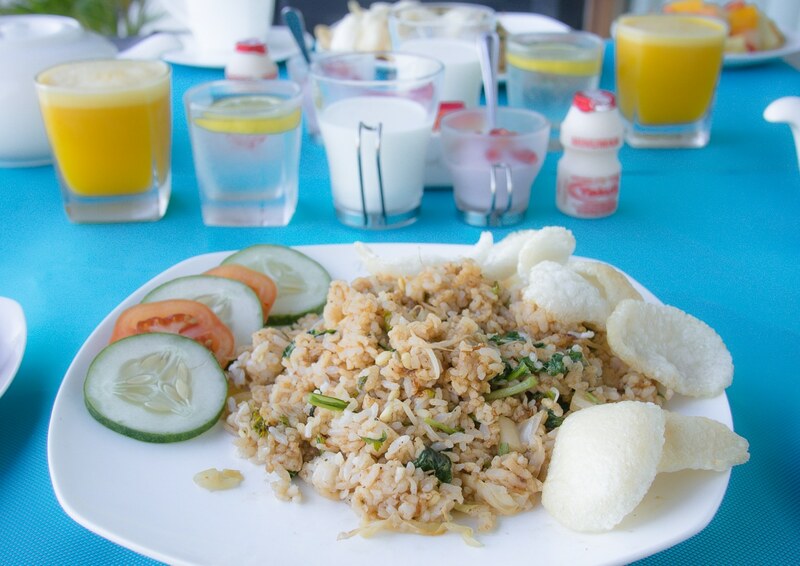 There’s fresh fruit, fresh squeezed orange juice, milk, water, tea, yogurt, and a big plate of Indonesia fried rice with fresh rice crackers on the side. Phew. We never did manage to eat it all! 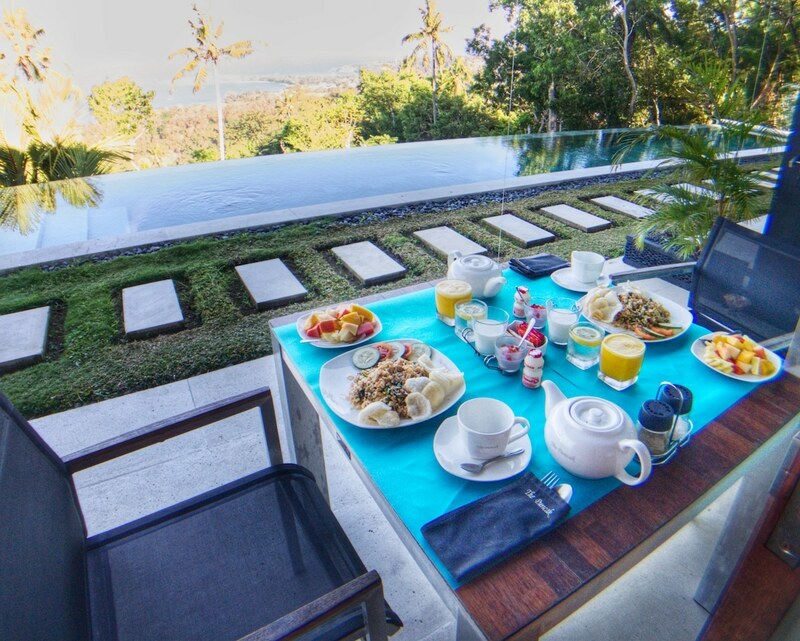 Work up an appetite in one of the twin infinity pools before this breakfast! 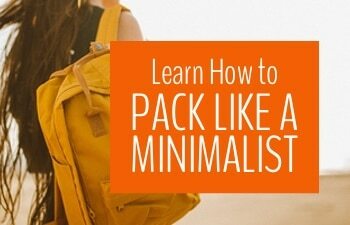 Designed for mindful travellers. Unlike many of the monster Lombok resorts down on Senggigi beach, The Puncak has a small footprint, both architecturally and environmentally. Water is heated via sun panel boilers, the hotel tries to reduce waste, and guests are encouraged to conserve water and electricity when they stay. Related: While in Indonesia, you might want to check out one of these five offbeat destinations. Taxi to go anywhere. The Puncak’s remote location means that you will need to take a taxi to go anywhere. We love to walk, so this was a little contrary to our usual travel habits. Most of the Senggigi beach hotels have the same problem, because Senggigi is so spread out that walking is not a great option. A taxi into the heart of Senggigi from The Puncak costs about $2 US and will be ready and waiting for you within 5 minutes of your request. The Puncak serves dinner and lunch on request. Based on the excellent breakfasts we had, and other guest’s reviews, we suspect the food is delicious. There are also plenty of Senggigi restaurants, with emphasis on fresh seafood and some international cuisine. Being vegan, and preferring to eat budget-friendly local food, we still managed to find two excellent restaurants in Senggigi. This is a guest house and restaurant just off the main busy street that runs through Senggigi. We were truly shocked by the excellent quality of the food here – it’s one of the best meals we had during our month-long stay in Lombok. They have a good selection of vegetarian and non-vegetarian dishes. Recommended to us by Jean-Paul, this unassuming café offers a variety of Indonesian and Asian dishes, including a huge selection of curries from around the region. Excellent service, good prices, and great food. Senggigi is centrally located on the road between Kuta, Mount Rinjani, and the Gili Islands. You could easily make your base here and do a few multi-day trips to all of Lombok’s attractions. The Puncak arranges trips for a variety of activities, such as a cultural tour of Lombok, a trip to the famous Senaru waterfalls, or even a trek up Rinjani! They also happily organize transfers to the airport and to the Gili Islands or will arrange your Lombok Bali fast boat connection. If you’re tough enough, we highly recommend a trek up Rinjani. Follow us on Instagram for more adventure photos. Beach time. In Senggigi itself, the biggest attraction is the beach. Much of the beachfront around Senggigi is taken up by high-end resorts but there are a couple of public beaches, too. For a touristy beach experience with plenty of hawkers and gawkers, head to Senggigi Beach. For the local beach experience, visit Kerangdangan Beach on a Sunday afternoon. To gain sneaky access to a private beach, we ate lunch in one of the Senggigi beach hotels and then wandered their beaches after our meal. Water sports. Where there is beach there is always a good selection of water sports. In Senggigi, you can book snorkelling or scuba trips, or rent a boat for kayaking and sailing. There is some surfing, but much better spots can be found elsewhere in Indonesia. With only five rooms, The Puncak fills up quickly. Be sure to make your reservation now if you want to relax in secluded luxury. Contact The Puncak directly for the best prices and all the up-to-date information. If you prefer to use a booking service, here’s our personal link to The Puncak on Booking.com. If you use it, we’ll earn a small fee at no cost to you. Thanks! Take a short boat trip to the Gili Islands. Gili Trawangan, Gili Air, and Gili Meno have three distinct personalities for different kinds of travellers. If you’re on a romantic break, we recommend Gili Meno. We’d heard the Gili Islands were crowded and touristy, so we were surprised at how much we liked them — even Gili Trawangan, the “party island” was pretty great! Take a Mount Rinjani trek. Scale the heights of Indonesia’s second-highest volcano. At more than 3000m, it will challenge you and take your right out of your comfort zone. 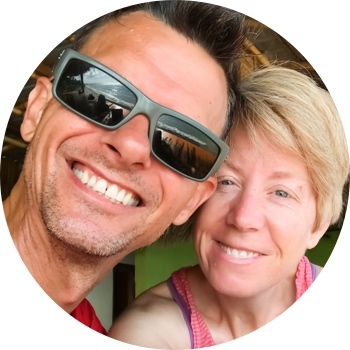 We were guests of The Puncak for our stay but our opinions are all our own (yes, it really was wonderful!). PIN if you want to stay here! Do you think The Puncak could be the best hotel in Lombok? Have you stayed anywhere better? Or worse? Let us know in the comments. Our family of 4 will be visiting Bali/Lombok in the spring. We have 5 nights on Lombok and I was wondering where a good central location would be to see the must-sees. We were originally thinking Kuta, but perhaps not central enough to see things further north. Any recommendations would be appreciated. As far a Lombok goes, there’s nowhere really central to stay and it depends what you’re planning on seeing. In the north, you can stay in Senggigi area which gives you better access to beaches, Mount Rinjani and the Gili Islands. But since the Lombok earthquake, I’m not 100% sure how accessible all of this will be – and you probably can’t do Rinjani with kids anyway. So, I actually think your initial plan of staying in Kuta area is a good one. That gives you access to some of the best beaches plus you can always head to the smaller less developed gilis (islands) near Lembar in the south if you want some island time. Pingback: 7 Essential Tips for Surviving a Mount Rinjani Trek | My Five Acres. Travel. Adventure. Yoga. I have always been a huge of infinity pools. I was in Bali last month and got to stay in some wonderful properties. I missed visiting Lombok last time but for sure on my list. Indonesia really seems to know how to do the beautiful pool / resort the right way, don’t they! I love infinity pools too… there is something incredibly romantic about them. Oh what a lovely retreat, and just look at that amazing pool. You know I went to Bali a couple of months back and it was in my plan to visit Lombok (Senggigi specifically)but due to lack of time, I decided to go to Gili T only and skipped Lombok. 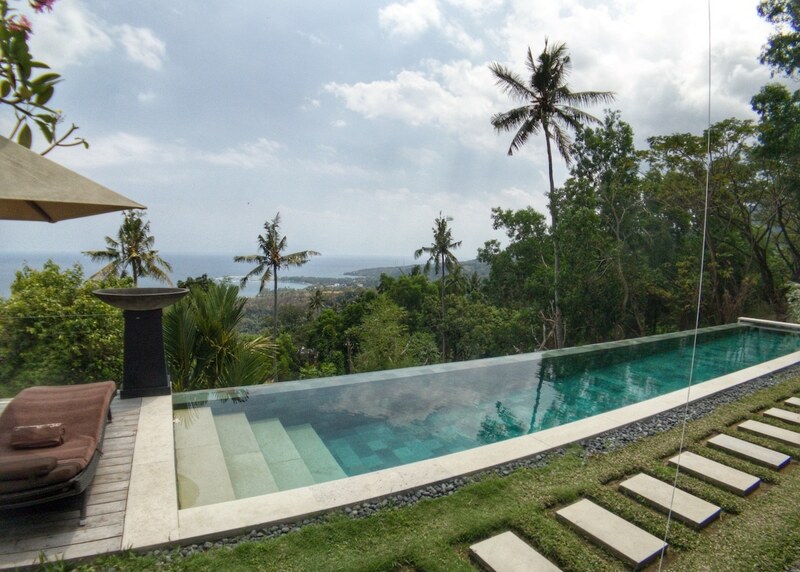 I think Bali is lucky to have quite a few such amazing retreats, at very affordable prices. There are so many lovely places to stay on Bali and Lombok – there really are some great places! People have done a wonderful job of opening them up for tourism. On Bali, maybe too wonderful, since it is becoming overrun! Yup, I wish I had one of those pools right now, sweltering in my no-window room in Vietnam! 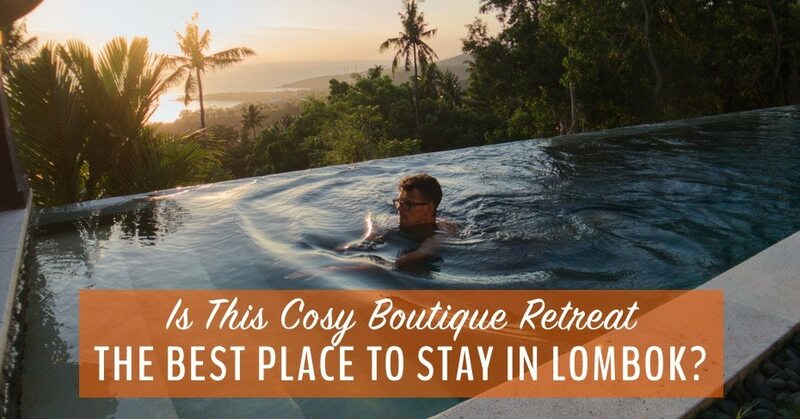 This looks fabulous and Lombok sounds like it should be on my wishlist. I think so. I’d like to go back and explore the places I didn’t get to! It’s the perfect place for people who like to mix a little luxury and a little adventure together. I love the spectacular views. Did the volcano erupt eventually or is it still just threatening? The eruption is still threatening and there were earthquakes all over Bali this morning. We’re hoping for the safety of the people there! Love that infinity pool! I’m guessing that’s to serve 2 or 3 rooms rather than to yourself? Regardless, it looks a great spot and with a fabulous view beyond. Yes, there are 5 rooms and two pools. Not a bad ratio! Oh, this looks absolutly beautiful. We are travelling to Indonesia in Feb but we will have out two teenagers with us and somehow I just cant picture it! Maybe when I can finally convince them to leave home, I will visit this special place! It is pretty lovely but you’re right, probably not the best place to bring your teens! You’ll have to hold out for a romantic break here once they finally flee the nest! This definitely looks like a gorgeous boutique hotel. 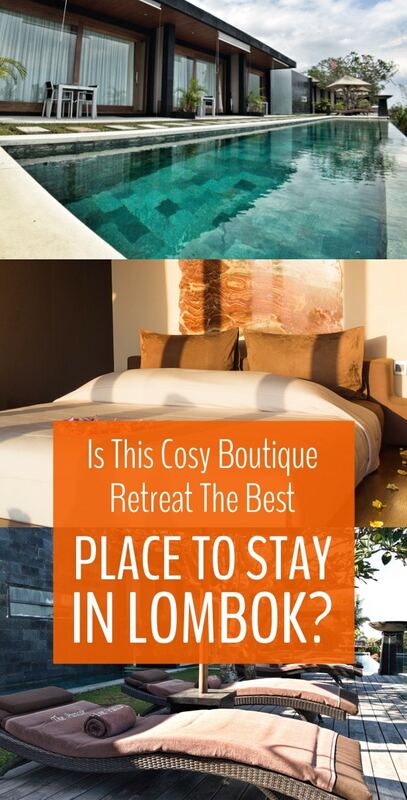 I’m hearing more about Lombok lately, going to have to check it out! Lombok is certainly a “hot” destination on the Indonesia trail. It’s like I imagine Bali was ten years ago. Already being developed but not quite so overrun with tourists yet.